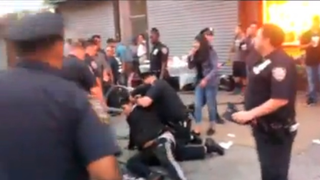 Jonathan Daza and NYPD officers involved in an incident after police asked vendors to leave on Sept. 14, 2014, in Brooklyn, N.Y.
A New York City police officer has been placed on leave following the beating of a street vendor that was caught on camera, reports Colorlines. Police Commissioner Bill Bratton told the media that the yet-to-be-identified officer has been suspended and relieved of his police duties. The vendor was beaten during a street fair in the Sunset Park neighborhood of Brooklyn last Sunday. Street vendors reportedly failed to leave the area after police gave them orders to do so. One vendor, Jonathan Daza, was thrown to the ground and kicked by the unnamed officer. “I was very concerned with a video that was taken and the actions of one of our officers who was seen kicking an individual. As best I could tell looking at that video, it seemed to be totally unprovoked. That officer has been suspended, and in terms of suspension in this department, that means he’s been relieved of his gun, his badge and his police duties,” Bratton said Wednesday. Five others were injured during the confusion. The incident is being investigated by Internal Affairs.